The outcome of the much awaited local government elections is now known and analysts are busy providing their interpretation of the results. Overall, the Sri Lanka Podujana Peramuna (SLPP), the newly established political party representing the interests of the dissident faction of the Sri Lanka Freedom Party (SLFP) emerged victorious sweeping the polls in the vast majority of local government institutions. At last count, the SLPP had won 239 of 340 councils on offer while the United National Party (UNP) won 41 councils. The Sri Lanka Freedom Party (SLFP) and the United Peoples’ Freedom Alliance (UPFA) together emerged victorious in 10 councils while the Illankai Tamil Arasu Kachchi (ITAK) won 34 councils, mostly in the North and East of the country. The Janatha Vimukthi Peramuna (JVP), despite their high profile campaign, failed to gain control of any council. However, in terms of the popular vote, a somewhat different picture emerges. 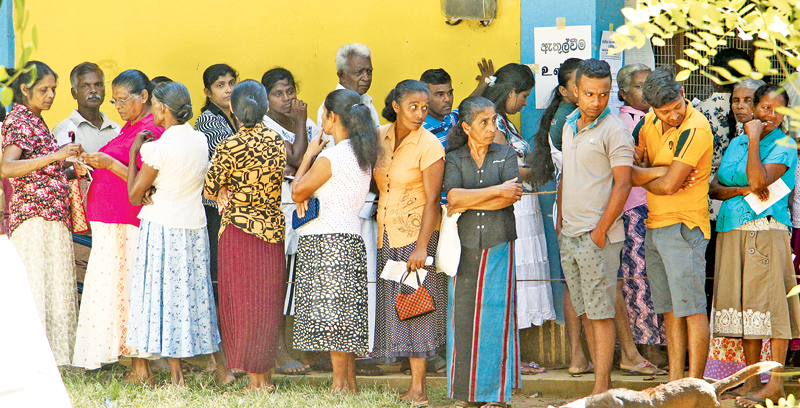 The SLPP polled 44 per cent of the overall vote while the UNP polled 32 per cent. The SLFP and UPFA together polled 13 per cent. The ITAK polled 3 per cent while the JVP polled 6 per cent of the overall vote. This was also the first ever election in the country where the first past the post system (applied to wards in each local authority) was combined with the proportional representation (PR) system in deciding the allocation of seats in each local authority. There was a collective sigh of relief that the dreaded preference votes did not operate at this election. Various interpretations have been provided by analysts trying to decipher the results. The results were surprising in that, while many expected a tough contest between the UNP, SLFP and the SLPP, the scale of the SLPP’s margins of victory was not predicted, even by SLPP stalwarts themselves. It appears that the UNP paid the price for its complacency in the run up to the poll. It rested on its laurels, hoping that the division within the SLFP’s ranks would make them an automatic victor. The SLFP’s vote was indeed divided but the division was not neatly in the middle: it was heavily skewed in favour of the SLPP. Thus, not only did the SLFP suffer, the UNP did too. The SLFP’s strategy of campaigning on the theme of corruption also boomeranged spectacularly. By making corruption the rallying cry, the SLFP hoped it would alienate voters from the SLPP- as its leaders are embroiled in several ongoing investigations- as well as the UNP- which is implicated in the Central Bank bond sale. If its strategy of driving away voters from the UNP was successful, it came at a price: those driven away from the UNP seem to have flocked to the SLPP and not the SLFP. Also proving to be a disappointment at the poll was the JVP. With public dissatisfaction high with regard to the major parties, the JVP was expected to make an impact at this election. Yet again, they have proved that catchy slogans and crowds at rallies do not necessarily translate into votes at an election. Undoubtedly, the big winner was the SLPP. As noted in these columns previously, this was a make or break election for the new party. If the SLPP performed poorly at this election, that would have spelled the end of the Rajapaksa dynasty and the project to resurrect their power base would have been stillborn. However, the SLPP- and the Rajapaksas- have proved that, three years out of office and out of power, they are still a force to reckon with. What has gone mostly unnoticed and unappreciated is that the election was conducted with very high standards. There were no serious incidents of election related violence apart from minor skirmishes. More importantly, state resources were not abused in the lead up to the poll. Ironically, this was possible because the government kept its side of the ‘good governance’ bargain, although its benefactors were the opposition. At the time of writing, the immediate fallout from the elections is as yet unclear. There is no doubt that new political alliances will take shape, but their contours are not discernible right now. However, some potential political scenarios are worthy of consideration. Revelling in the afterglow of victory, former President Mahinda Rajapaksa held a media briefing, flanked by his loyalists in the SLPP. There he called for a general election forthwith, stating that the government had lost the mandate to govern. He stated that he was not interested in cobbling together a coalition from within Parliament to become Prime Minister and form a government. Rajapaksa’s claim that the government has lost the mandate may ring true to his supporters but stark constitutional realities stand in the way of his demand for a general election- and, as a person who was twice elected as President, he cannot be unaware of those considerations. The 19th Amendment to the Constitution specifically precludes the dissolution of Parliament by the President until after four and a half years, unless Parliament resolves to dissolve itself with a two-thirds majority. In the current scenario where the UNP is the single largest party in Parliament, Rajapaksa will not be able to fashion a two-thirds majority for the purpose of dissolving Parliament. As such, this Parliament will be in office until February 2020, which will be until after the next presidential election which is due in January 2020, the latest. Joint Opposition (JO) stalwarts have been making similar demands, echoing Rajapaksa’s sentiments. It was however made clear that the UNP will not yield to such tactics. Deputy Leader of the UNP Sajith Premadasa put it succinctly when he said that although Rajapaksa fell victim to the ploy of calling for early elections, the UNP wouldn’t be falling into the same trap. In the aftermath of the election, there has been frenzied political activity. President Maithripala Sirisena has met with SLFP ministers, the majority of whom have indicated that they would be unwilling to serve in a coalition government with the UNP. This is because they fear that remaining with the UNP will hinder their prospects of re-election at the next general election. Most of them have indicated a preference to realign with the Rajapaksa camp. The President reportedly gave a patient hearing to the views of the SLFP ministers and indicated that he will be orchestrating ‘major changes’ within the government but did not elaborate what these changes would be. For some SLFP ministers, at least, a return to the Rajapaksa camp cannot be taken for granted. In their absence and in forming the SLPP, Rajapaksa loyalists have taken up positions as electoral organisers for electoral divisions and toiled hard in the opposition while their predecessors in the SLFP were enjoying ministerial perks in the government. Now, when the SLPP has just won an election, they are not willing to let all that hard work be in vain by simply handing over the reins in the electorate to those returning to the fold from government ranks. The President was also meeting with UNP seniors to try and work out a way forward. It is understood that the UNP has proposed that it would form a solely UNP government with support from other parties. The UNP has the support of 106 parliamentarians (without counting dissident MP Wijeyadasa Rajapakshe but including one Sri Lanka Muslim Congress parliamentarian) and needs the support of seven others to form a government. UNP stalwarts point out that Chandrika Kumaratunga’s 1994 government was in office for its full six year term with 105 MPs. The additional support for the UNP could come from either ITAK (who would support it on an issue by issue basis) or from SLFP MPs crossing over. At the time of writing, even leading ministers were uncertain what the eventual political outcome would be but they were confident that a clearer picture would emerge within days rather than weeks. In that sense, the local government elections lived up to its expectation: it became an election that defined the future political direction of the country, at least in the short term.